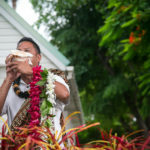 Kona Photography on the Big Island. Had the pleasure of photographing a great couple from Australia at the Kona Beach House on Alii Drive. 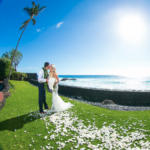 The Kona Beach House offers both a great place for family and friends to stay and a great place for both the wedding and the reception. The house is right on the ocean and has a nice lawn area for the reception. They had quite a downpour before their wedding, but the rain stopped shortly before their wedding started. Even with the rain we kept on shooting. The added benefited of using Canon’s flagship camera the 1DX which is able to keep on shooting even in heavy rain. Thankfully the couple went with a tent to keep their guests dry before the wedding started. The coordinator for the event was Sara Kam with Jots of Thoughts Weddings. She and her team did a great job as always even with the heavy rain. Most of the staff was drench from head to toe but they kept on serving drinks and doing set up. True professionals.